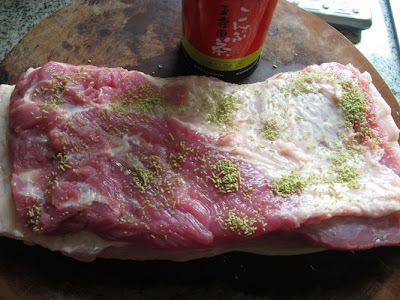 One of the cooking ingredients that i was planned to buy during the trip to Japan is Konbucha, after saw Nami (Just One Cookbook ) introduced of this seasoning to be added when making Japanese Chashu﻿. According to her, Konbu-cha is from Konbu/kombu seaweed and it is full of konbu glutamine and asparagine umami deliciousness. After several visits to departmental store like Daimaru and Isetan in Kyoto and Osaka, I still failed to get Konbucha. I decided to asked the staff (i think i was in Isetan) and shown her the picture of Konbucha, and she brought me to tea section and shown me Kombucha, she said Kombucha is same as Konbucha. This was what i bought back, Kombucha. After i went back to hotel, i re-checked what Nami wrote on Konbucha and realized that Konbucha is not Kombucha, just one letter difference "n and m"...Now i don't know what to do with Kombucha? I did not give up, I went to look Konbucha by myself after my hubby went for meeting on our 1st day in Osaka. I copied down the address (but at this moment i forgot where i got the shop address at that time, memory loss ) and went to took subway alone and started my adventure in big city of Osaka and heading to the place where to get Konbucha. This is the real Konbucha i got from Osaka...the same brand that Nami is using.. I thought with the address with 天王寺, so i just stopped at 天王寺 station, but when i double confirmed with the staff stationed at the subway. They were so friendly, took out the detail map and checked the address i gave them, and they told me i have to switch two difference stations with two difference subway lines..At that moment, i was thinking whether i should proceed this Konbucha adventure since i was totally new to their subway system. ﻿At last, i still decided to proceed and later i found their subway is not that difficult once you understand how it works. After came out from the subway station, i started to look for the shop, walked for quite far still could not locate the place. Luckily this Japanese uncle came approached me and he was so kind personally brought me to the shop. The 1st picture as per above were all the goods that they are selling. They were quite surprised a girl all the way from Malaysia to their Osaka shop to just purchase this Konbucha, so they gave me discounted price, hehehe..
Special Thanks to this Japanese uncle for his kind help. 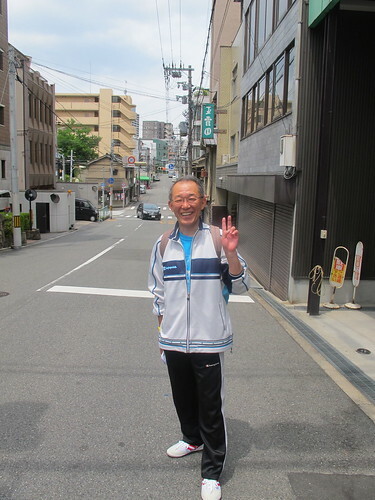 You can see the green signage behind him was the shop that i went.. Actually this uncle was on his way by walking to 天王寺 which take about 30mins..
After came back home, i started my 1st Japanese chashu making. 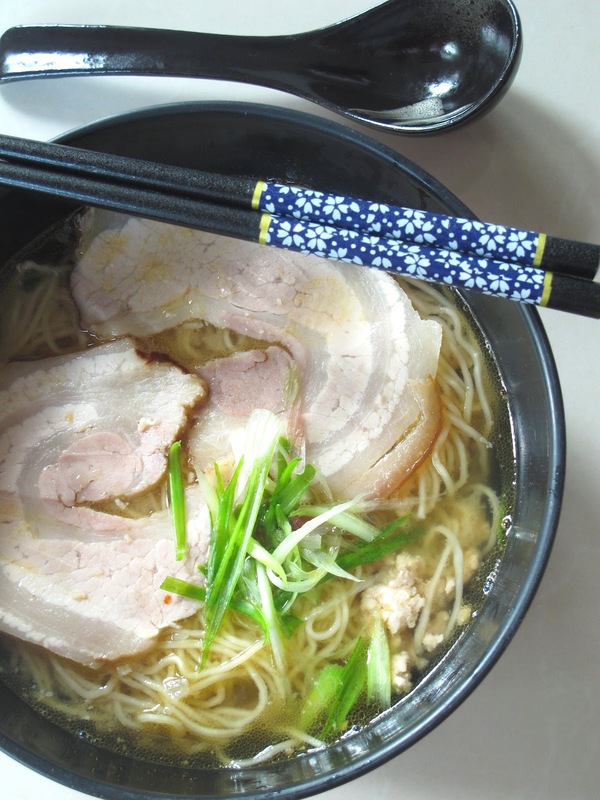 I always like this thin slices of round chashu in Ramen soup. 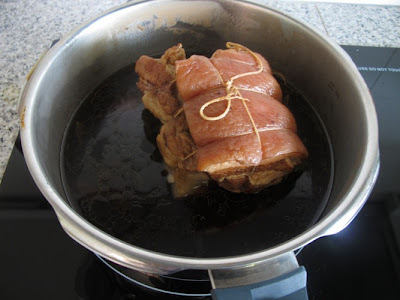 I did not recorded down the exact ingredients this time, recipe largely adapted from Nami @ Just one cookbook's chashu recipe, but i made to the usual round chasu shape with some minor changes..
5. Cook in the water, sake, soy sauce, sugar, spring onion, shallot and ginger mixture for several hours till cooked. 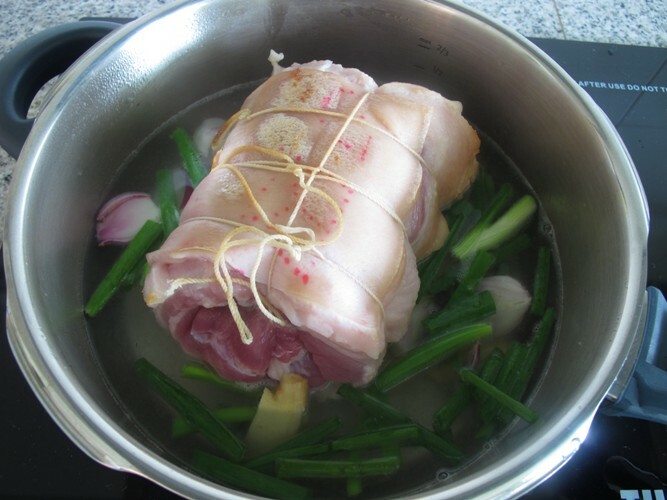 I use speedy version as i cooked using a pressure cooker which only took me 25mins. 6. 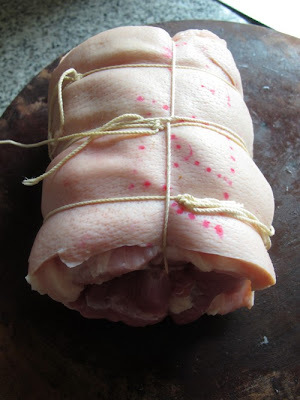 Japanese Chashu is ready. I keep in the fridge overnight before slice it as to firm it up so easy to slice. 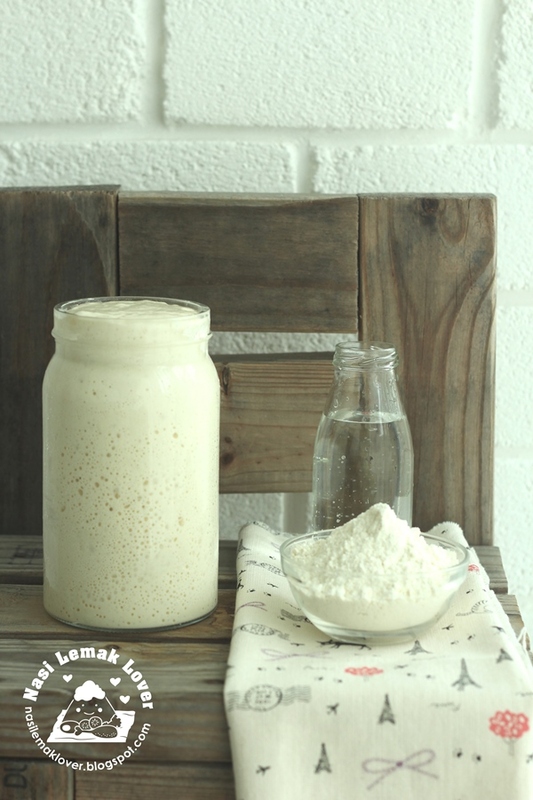 Latest update on 20th July 2012- few readers commented that Konbucha is same as Kombucha because the pronounciation﻿ issue. 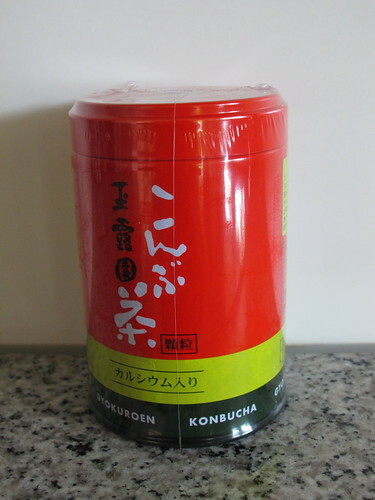 I decided to open the Kombucha and taste it, and i found Konbucha has stronger kombu taste than Kombucha, both are seasonings powder. 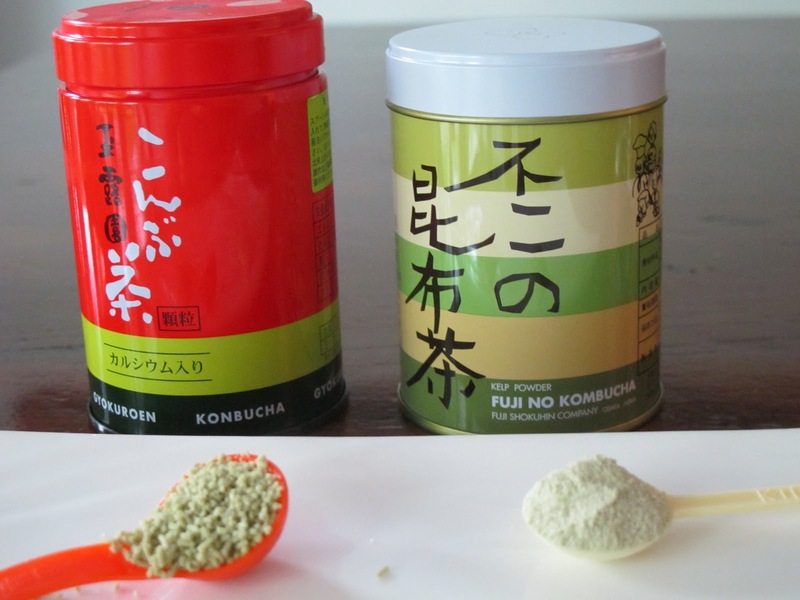 Kombucha is in fine powder form whereas Konbucha is slightly in coarse powder form. 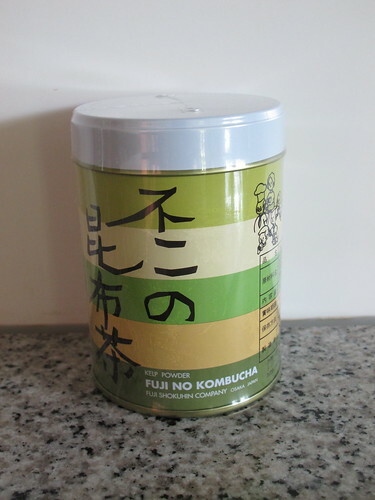 If you still confuse what Kombucha or Konbucha is, to simplify it, it is similar like those chicken stock seasonings powder that we usually use, but this is with Kombu 昆布 flavour. I still need Nami to further clarify whether are the the same..Nami, please help.. Thanks to Nami for further explained this, and it is concluded that Konbucha and Kombucha, they are the same thing. I just added Kombucha when i stir fry green veggie, and it actually add flavours to the veggie , similar like the MSG i use to add in when stir fry veggie. Updated on 26th Aug 2012- Thank your for participated in this giveaway. I have chosen the winners (i actually gave away 2 bottles)﻿ , and the winners have received my notification via email.. I'm glad you got the help you needed. THere's so much to learn if we really want to know in details of the Japanese ingredients. I think you are getting good at it more or less now. We used to visit Japanese Restaurant when dining out. 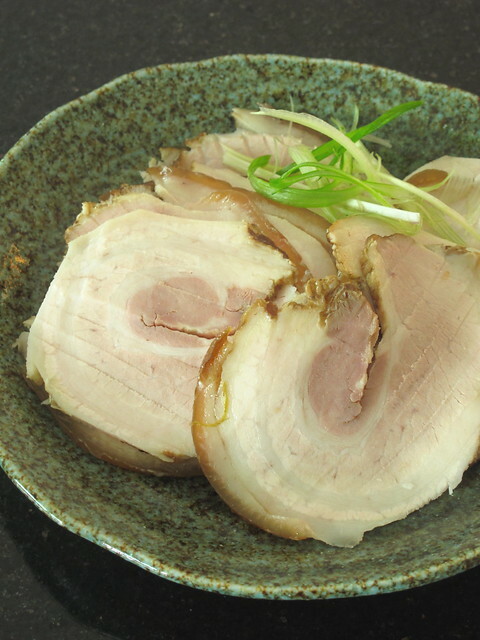 We used to have the thin slices of round chashu in noodles soup. Never think off we actually can make it at home. Yours look great! ohh this is an interesting post. 'Kon' n 'kom' make a huge difference huh...! 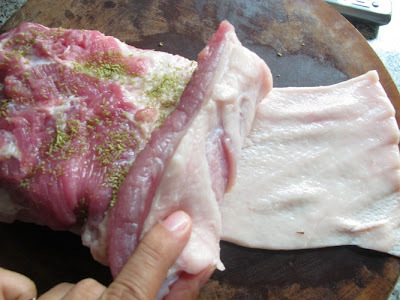 I like pork belly cook this way, looks real good. Another giveaway ...yeah...I want to join. I waiting your next give away....because I like Japanese food so much!! Sonia, you are so brave to go out on your own in Japan specially to get this ingredient. I am very kiasi, so would probably drag poor husband to follow because mati mati must buy the konbucha. Such gorgeous pork with ramen... i love to try it. oishi! I remembered in one of my trips to Japan... My husband wanted to visit this dinosaur shop and we had to change so many trains to get there! Which we did finally! I love Japanese food and it's always Japanese or Thai if we were to eat out. Thank you for thinking of your readers ( I'm a silent one which have been following you everyday :) ) e.even in your trips. I think you maybe can use the kombucha too if I am not mistaken, because when japanese hiragana when translated into romanji(alphabet) sometimes N turns into M due to the pronounciation. In japanese the 'n' refers to ん however there is no such word that pronounce as 'm'. I am not very good in Japanese hence can't explain why sometimes the ん pronounced as 'm' instead on 'n' in some words. A very good example would be ganbate but always pronounced as gambate! Anyway you may double check with your friend. Just a small thought of mine, hope you don't mind. Looks so delicious and filling.Thanks for sharing. I fell in love with Japanese cuisine since my first and so far last visit to Japan 10 years ago. Hi Sonia, that noodle bowl looks fantastic! Thanks for sharing. What a interesting read- the Japanese are always so helpful and polite! I love Japanese food, its fresh, taste great and ever so appealing to the eye. So here's the thing. Japanese write 昆布 "kon bu". However, when it's translated it becomes Kombu sometimes. If you try to buy 昆布　(konbu seaweed) for dashi stock, etc, the konbu package might say either Konbu or Kombu. So in that sense, we can use BOTH. However, if you Google Kombucha, Wiki tells you Kombucha is TOTAL different thing!!! 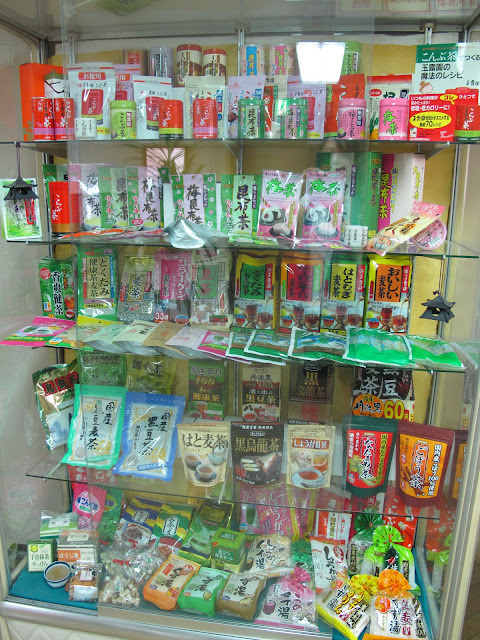 However, when Japanese company makes 昆布茶, they probably use English both Konbucha and Kombucha. Therefore, both of your Konbucha/Kombucha are the samething!!!!! I'm sorry you had to go through all the trouble. 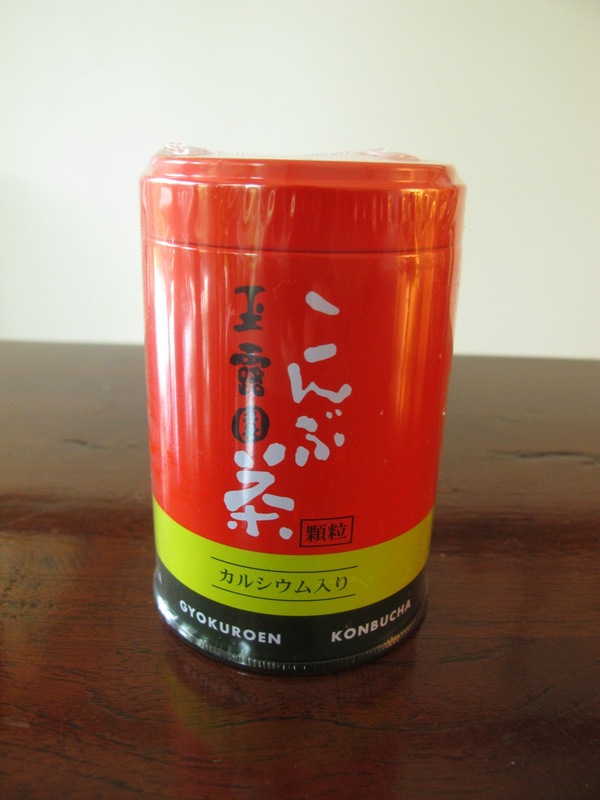 Konbucha can be found easily in a supermarket (TEA section of isle), I think, and you were lucky to go to a special store! Thanks for your kind mention, Sonia! I loved reading your konbucha adventure! But really salute your determination to get your konbucha! 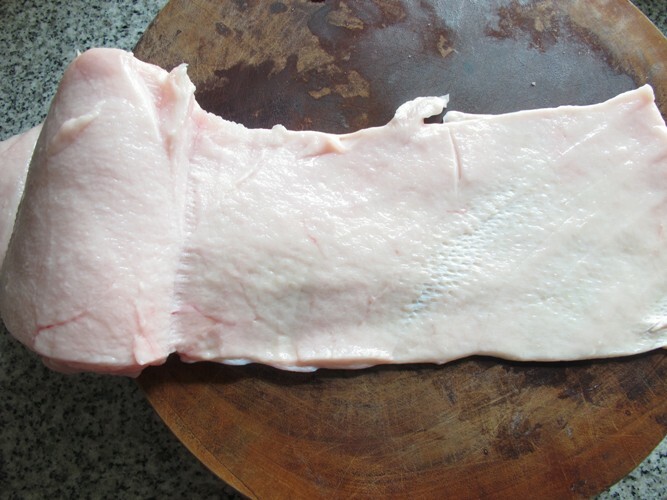 That thinly sliced chasu looks heavenly delicious! Wow! You are very determined to get your Konbucha huh! So brave of you to travel alone to find it....your chashu looks delicious! Just like the ones I had just yesterday at Hokkaido Ramen in 1U (Isetan) Very delicious! Sonia, I just want to "kepoh" here! So, after tasting the Konbucha, do you think it is a must ingredient to use for making the char siu? Can you think of something else to replace it? You know lah, not everyone is as good as you, go all the way to Osaka to get Konbucha, haha! Wow! Sonia, you are so brave and adventurous travel all the way just to look for Konbucha. If I were you I will also do the same because I think having an original Japanese taste is worth it..^^ Your Chashu looks so delicious! I love Japanese food! To me, Japanese food is more than just great tasting, it's really an art. It's a feast of the mouth and the eyes. Japanese food is perfectly balanced in taste so that you can really taste the ingredients used. Preparation of every dish is done with great attention to detail. And always visually impressive with their presentation in beautiful dishware. However, despite how delicious and authentic of having a meal in a Japanese restaurant, to me, nothing beats home-cook Japanese food. The food need not be fanciful but what's important is they are cooked for our loved ones from the heart. No thank you is needed when you see the big smile from their faces! Sonia, thanks so much for sharing such experience. I also wonder how the Japanese made this. Thank you for sharing this piece of information. My husband and I are ardent fans of Japanese food. He tried making the Chasu Ramen a few times but still lack of "something". I guess it must be the Konbucha you are talking about. It will be great if I could win the Konbucha so he could try making a delicious bowl of Chasu Ramen again.